Elder son of Col. & Mrs H.J. Roche, of The Colony, Burnham-on-Sea. Son of Sir Standish Deane O'Grady Roche, 3rd Bt (1845-1914) and Sybil (1872-1950), only daughter of Col. Julius Dyson­Laurie, Gloucester Pl., W. Succeeded father, 09.12.1914. Married (1946) Evelyn Laura, only daughter of Major W. Andon; two sons. Son of James Harold Rodier (1877-1965), and Winifred Agnes Gallaway (1880-1967), of Huntershill, Wilmslow, Cheshire. Education: Shrewsbury School (Housemaster R. Sale; Michaelmas term 1930-1935; Praepostor). Went into business in Belgium. Son (with one half-brother) of Mervyn Harley Rodney (1890-1964), and Dorothy Norton Thompson (1885-1917). 01.08.1940 - (06. )1942 French Ship "Calais"
Only son of Richard George Tennant Roe, and Bertha Nugent (née Nixon), of Yelverton, Devon. Education: passed the Accountant Officers Technical Course. Son of Lt.Col. Charles Douglas Roe, DSO, OBE (1882-1960), Indian Army, and Daisy Blanche Marion Mackenzie-Kennedy (1883-1951). 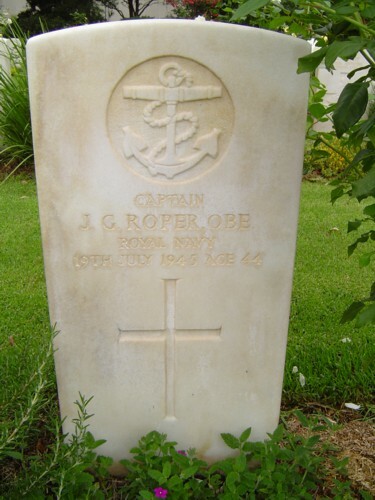 Brother of Lt. (A) Richard John Owen O'Neill-Roe, RN. Married (04.1934) Isabella Grace Farley; two sons. Rejoined Admiralty in Bath and AUWE Portland as a Naval Civil Servant, 1962-1972. MIEE. died between 1952 and 1958 ? One-time boxing champion for the RN in India. Humane Society bronze medal, 1913; Order of the White Lion of Czechoslovakia, 4th class (25.11.1947; services to Czech forces Harwich) Education: The Old Ride, Bournemouth; HMS Britannia. Barrister & philatelist. Exhibited his Great Britain internationally, 1955-65. President Royal Philatelic Society London 1964-67 and largely responsible for Society’s Centenary History 1969. Contributed ‘Philatelic Appreciation’ to Philatelic Congress of Great Britiain (PCGB) Yearbook 1954. Co-author with LR Ray, of ‘Background to Philately’ . Chairman of Executive Committee PCGB 1956 and 1959. Congress Medal, 1967. Judge at London International Exhibition 1960. RDP 1970, and Chairman of Board of Election, 1957-60. President Brighton & Hove Philatelic Society of which he wrote a short history in 1956. Married ((09? ).1928, Long Ashton district, Somerset) Faith D. Clarke. * On 8th April, 1940, H.M.S. Glowworm was proceeding alone towards West Fjord, Norway, when she met and engaged two enemy destroyers, hitting at least one of them. The enemy broke off the action and headed north. Lieutenant-Commander Roope, though appreciating the intention of the enemy to lead him on to his supporting forces, gave chase. The German heavy cruiser, Admiral Hipper was sighted closing the Glowworm at high speed, and an enemy report was sent, which was received by H.M.S. Renown. Because of the heavy sea it was not possible for the Glowworm to shadow the enemy, and the Commanding Officer decided to attack. Ten torpedoes were fired without success; then the Glowworm, badly hit and her speed reduced, closed and rammed the Admiral Hipper. As she withdrew the Glowworm opened fire again, and scored one hit at 400 yards range. Badly stove in forward and riddled with enemy fire, the Glowworm heeled over, and the Commanding Officer gave the order to abandon her. Shortly afterwards she capsized and sank; only 31 out of her complement of 149 were saved. The Victoria Cross is bestowed upon Lieutenant Commander Roope in recognition of his great valour. Only son of Edward Plumer Rooper (1861-1939), and Annie Elizabeth Coster-Edwards (1865?-1903), of Overton Bridge, nr Wrexham. Married (08.1931) Ann Pitcairn Campbell (09.06.1910 - 02.2001), only daughter of Archibald Douglas Pitcairn Campbell (1880-1951), and Olive Marie Moser (1883-1954), of Deeside, Bangor-on-Dee, nr Wrexham; one son. Son of late John Gregson Roper, OBE; married 1933, Sylvia, daughter of E.F.L. Hopkins; one daughter. Son of John Gregson Roper and Marion Roper. Younger son of Campbell Roper, ICS, and Mrs Roper, late of Budleigh Salterton. Married ((09? ).1952, Alton district, Hampshire) Marjorie Pamela Wrench, third daughter of J.M.D. Wrench, CIE, and Mrs Wrench, of Sherborne St John, Basingstoke, Hampshire. Third son (with two sisters and four brothers) of Prof. Herbert Jennings Rose, MA, FBA (1883-1961), classic scholar, and Eliza Harriet "Elsie" Plimsoll (1889-1939), of St Andrews. Brother of Sg.Lt. John Vincent Rose, BSc, MRCS, LRCP, RNVR. Married (11.09.1943, Little Kingshill Church) Third Officer Margaret "Peggy" Thomson, WRNS, daughter of the Rev. P.T. Thomson and Mrs Lily Thomson, of Holmer Green, Buckinghamshire; two daughters. Mary Dilke, daughter of Ashton Wentworth Dilke, MP. Cabinet Office, Official Naval Historian, 1949-1960. Lees Knowles Lecturer, Cambridge, 1961; Distinguished Visitor Lecturer, US Naval Academy, Annapolis, 1965; Richmond Lecturer, Cambridge, 1967; Leverhulme Res. Fellow, National Maritime Museum, 1974. Navy Records Society: Councillor, 1956-66, and 1968-70; Vice-President, 1966-68, 1970, Hon. Life Vice-President, 1976. President Cambridge Br., RN Assoc., 1976. Hon. LittD Leeds, 1975; Hon. DLitt Oxon, 1980. Chesney Gold Medal, RUSI, 1975. Second son of Sir Archibald John Campbell Ross, KBE (1867-1931), and Maria Gusiev (1875-1960). Married 1st (14.09.1929, St Paul's Church, Knightsbridge; marriage dissolved 1950) Alice Behrens, daughter of banker Paul Behrens of the Salomon Oppenheim Bank, of Zehlendorf, Berlin, Germany. Married 2nd (16.03.1950, Westminster district, London; marriage dissolved 1969) Lucia M. Boer, daughter of Julius Boer; two daughters. Married 3rd ((12? ).1975, Kensington district, London) Manuela Gandara "Manolita" Harris (21.10.1947 - 03.08.1988). GRSG. CEng, MiMechE, AFRAeS. Joined Hawker Siddeley group, Nov. 1953, and retd Sept. 1965. Consultant to Grievesou Orant, Stockbrokers, 1965-1979, and other companies. Chairman, Combined Services Winter Sports Association, 1951-1967. Freeman, City of London, 1955. Son (with one brother and two sisters) of V.Adm. Charles Wolfran Round-Turner (1879-1953), and Janet Mary Verrall (1887-1977). Son of Lt.Cdr. Reginald Dudley Rowe, DSC, RN (1893-1966), and Elaine Maud Petre (1894-...). Education: RN College, Dartmouth (01.05.1936-12.1939; Hawke House; Admiralty No. 1669). Married (19.11.1921) Elaine Maud Petre (born 05.05.1894), daughter of F.L. Petre and M.E. Rawlinson; one son (Cdr. Barry Loraine Dudley Rowe, DSC, RN). Chairman, Grovebell Group Ltd, 1972-1975. Member Management Committee, The Freedom Association, 1978-1985. President, Royal Naval Benevolent Trust, 1978-1984. County Councillor, Surrey, 1977-1981. Yeoman Usher of the Black Rod since 1946; Secretary to the Lord Great Chamberlain since 1948.